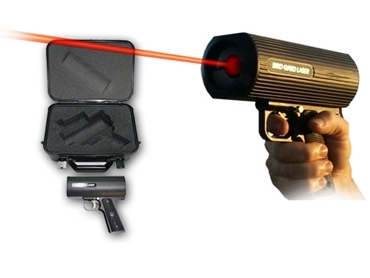 Handheld laser guns from Bird Gard are employed as a convenient, effective and humane method to drive away birds from areas where they are not wanted. Birdstrikes continue to be a problem for aviation worldwide costing approximately $US 3 billion annually. Increasingly funds are being directed towards research, which focuses on bird control and avoidance methods. One method that is proving successful is the use of handheld laser guns to scare birds away from the airport environment. There has been a significant increase in the rate of birdstrikes being recorded in Australia since 1992. Both the International Civil Aviation Authority (ICAO) and Australian data indicate that the majority of strikes occur in and around the airport environment during take-off, approach or landing phases of flights. Handheld laser devices are highly effective as a deterrent to birds, keeping them away from airfields and other sensitive environments. Continuous research in the acoustical control of birds may provide efficient solutions for reducing the occurrence of birdstrikes.